Officials said Ms Bharti, who was given today's date to depose, would be questioned about her role in relation to a firm Mishail Printers and Packers Private Limited. Officials said Lalu Yadav's Misa Bharti was given today's date to depose. 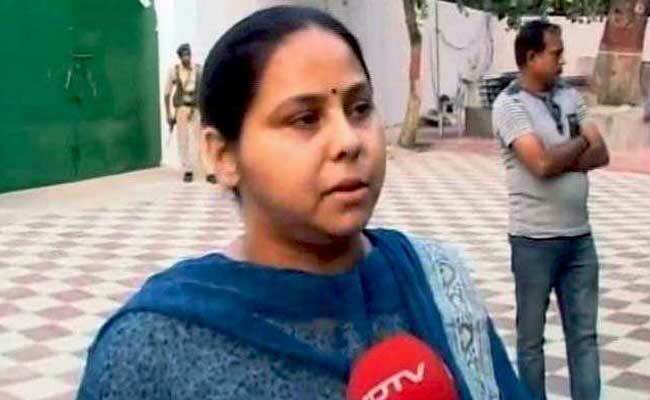 New Delhi: Rashtriya Janata Dal lawmaker and Lalu Yadav's daughter Misa Bharti today appeared before the enforcement directorate in connection with the probe in a Rs 8,000 crore money laundering case. Ms Bharti, the daughter of RJD chief Lalu Prasad, deposed before the investigating officer (IO) of the case at the central probe agency's zonal office here shortly after 11:00 AM. Officials said Ms Bharti, who was given today's date to depose, would be questioned about her role in relation to a firm Mishail Printers and Packers Private Limited and her other finances and her links with a CA arrested by the agency earlier. The Enforcement Directorate, on July 8, had conducted searches at her Delhi farmhouse, that of her husband Shailesh Kumar and the firm in connection with this case. The agency is expected to grill her on these subjects and record her statement under the Prevention of Money Laundering Act (PMLA). Her husband Shailesh Kumar was also summoned yesterday but he reportedly skipped the date. The ED raids last week had come a day after the CBI had raided multiple premises of Prasad and his family in a corruption probe case. The latest summons to Ms Bharti and her husband are related to a Rs 8,000 crore money laundering probe being conducted by the agency against two Delhi-based businessmen brothers, Surendra Kumar Jain and Virendra Jain, and others who are alleged to have laundered several crore rupees using over 90 shell companies. The Jain brothers were arrested by the ED earlier under the PMLA. One of the firms that the arrested duo dealt with was Ms Mishail Printers and Packers Private Limited. Ms Bharti and her husband are alleged to have been directors of this firm in the past. The agency said it was detected that 1,20,000 shares of Ms Mishail Printers and Packers Private Limited were bought during 2007-08 at a rate of Rs 100 per share by four shell companies -- M/s Shalini Holdings Limited, M/s Ad-Fin Capital Services (India) Pvt. Ltd, M/s Mani Mala Delhi Properties Pvt. Ltd., and M/s Diamond Vinimay Pvt. Ltd. These 1,20,000 shares, it said, were allegedly bought back by Ms Bharti at Rs 10 per share. The ED had also arrested Rajesh Agarwal, a Chartered Accountant allegedly linked to Ms Bharti, who provided accommodation entries (black funds) of about Rs 60 lakh to M/s Mishail Printers and Packers Private Limited. The searches, they had said, are part of investigations to unravel these links which allegedly routed black money using the shell companies in question. Shell companies are firms set up with nominal paid up capital, high reserves, and surplus on account of receipt of high share premium, investment in unlisted companies and no dividend income or high amount of cash-in-hand. The ED is the third agency probing alleged financial irregularities by the Lalu Prasad family after the CBI and the Income Tax department which recently attached benami assets worth about Rs 180 crore (market value) in its investigation against them.